There can be a mystery to sales at the earliest stages of a startup. Wise counsel on building a strong sales deck or designing sales onboarding exists, but when it’s just an impassioned founder or salesperson drumming up leads pre-launch, advice is often ambiguous and reduced to flexing a “go get ‘em” attitude. It’s enthusiasm for an idea that’ll engage your early customers, but this isn’t uncharted territory without tested tactics for growth. With more than a decade of startup sales experience, Whitney Sales' expertise might as well be her last and middle name. Creator of the The Sales Method, she supports founders who need a seasoned sales executive early on. 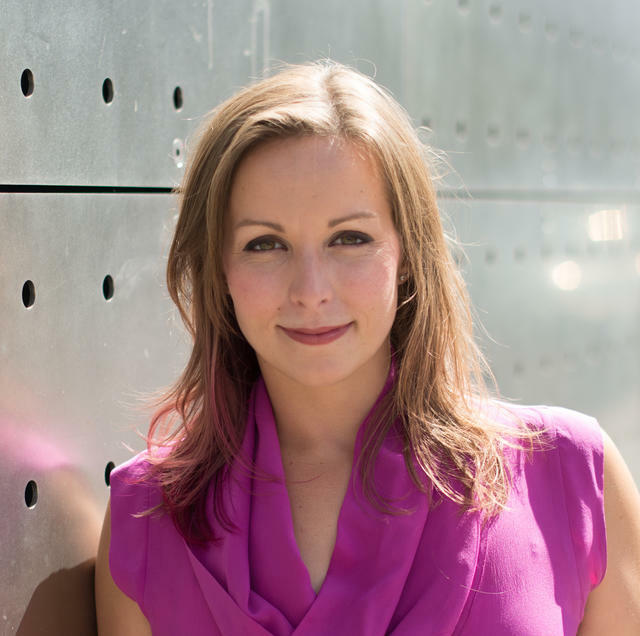 She’s currently the VP of Sales at TalentIQ, but has been in sales leadership roles across a range of startups. At Wanelo, Sales and her team sealed 200 partnerships — including Nordstrom, Urban Outfitters and Sephora — in just eight weeks. Within a year of leading sales, she helped SpringAhead rise to #567 on the Inc 5000. At TalentIQ, Sales has generated over $1.3 million in pre-launch sales in under eight months. If your startup is still building its early sales function or tallying its first deals, it must approach sales differently. According to Sales, early-stage companies need to place more emphasis on their founding narrative, customize their customer stories and integrate both seamlessly into a structured prospect pitch. Here, she deconstructs each area with exercises in a step-by-step, minute-by-minute format. Let’s get started. No customers? Pull from your beta users. Not yet? Draw from the startup’s origin story. There’s always a seed. Go earlier than Steve Jobs in the black turtleneck. Invoke him in the calligraphy class when he realized that fonts were a big deal — and what that meant for the first Apple customers. Our founder, Sean, started his first company in college three years ago. He was looking for an Android developer for an app and sat down with a recruiter to outline what an ideal candidate would look like. The recruiter said she’d get back to him with candidates shortly. Sean soon learned that ‘shortly’ meant ‘ten days.’ By the time the recruiter sent over candidate profiles, Sean had already sourced his own candidate, translating to thousands in lost business for the recruiter. Knowing recruiters work on commission, he wanted to understand why it had taken so long to send candidates. She showed him her screen, which had 50 tabs open, each representing different aspects of a candidate’s online profile and work history and living in a different system of record. He realized that recruiters are missing one place to go for key, up-to-date candidate information. Investigating further, he learned that this challenge exists for most workflow management tools. None of them track people, they just track activities on people. There wasn’t a simple way to keep a person’s online personal and professional footprint up-to-date in workflow management tools recruiters, salespeople and marketers use everyday. As a result, he developed TalentIQ. [SUBJECT] [ONCE UPON A TIME], [SITUATION] [CUSTOMER PROBLEM]. [CUSTOMER] and realized [FEATURES OF PROBLEM]. [COST]. [SUBJECT] learned [IDEATION PROCESS]. As a result, [SOLUTION]. ONCE UPON A TIME. When did this happen. What was going on at this time? Example: Started his first company in college three years ago. SITUATION. Set the stage. Describe the scene. Example: He was looking for an Android developer for an app and sat down with a recruiter to outline what an ideal candidate would look like. The recruiter said she’d get back to him with candidates shortly. FEATURES OF PROBLEM. Recruiters work on commission, he wanted to know why it’d taken so long. She showed him her screen, which had 50 tabs open, each representing different aspects of a candidate’s online profile and work history - each living in a different system of record. He realized that recruiters are missing one place to go for key, up-to-date candidate information. COST. How does the problem translate to time or money. Example: By the time the recruiter sent candidate profiles to Sean, he’s already sourced his own candidate, translating to thousands in lost business for the recruiter. IDEATION PROCESS. Identify the process of understanding what the need is and hypothesis what is need to fix it. Example: Investigating further, he learned that this challenge exists for most workflow management tools. None of them track people, they just track activities on people. There wasn’t a simple way to keep a person’s online personal and professional footprint up-to-date in workflow management tools recruiters, salespeople and marketers use everyday. SOLUTION. Keep this brief. It is about you, not what you do. Ta-da moment! Example: As a result, he started TalentIQ. As you convert prospects to paying customers, your number of use cases and customer stories will naturally grow. “After getting your first use case, the next milestone is having a set of three to four to pull from. You want to have each use case and customer story to reference for each of the target markets you’re going after. Know the unique attributes of each customer, the problem your product solved, and how your product solved that problem in detail. Look for use cases that exhibit a range of customer attributes — such as size, region, industry or tech stack. Map unique identifiers in your story that will resonate with your prospect,” says Sales. met with its VP of Marketing, they mentioned that cancellation rates during onboarding had increased 12% over the last three months. Retention rates were dropping and the company’s reputation was suffering. They believed this was a customer communication issue during onboarding. Onboarding emails weren’t targeted to where a user was in the onboarding process, resulting in low click-through rates, high unsubscribe rates and eventual cancellation. We implemented our automated behavioral email marketing and enabled XYZ Scalability to email their customers based on behavior in the product. This allowed XYZ to send personalized emails to their customers based on their specific onboarding path. Two months after we implemented automated behavioral email marketing, we’d reduced the time to convert by 30% and increased overall conversions by 63%, which translated to 4.2M in revenue for XYZ. One of my clients, [CUSTOMER NAME], who is in the same [QUALIFICATION CRITERIA], was having the same problem. When I met with their [TITLE], they mentioned that [EXAMPLE OF CUSTOMER PAIN POINTS]. [ADDITIONAL DETAIL]. We implemented [PRODUCT FEATURE], and enabled [CUSTOMER NAME] to [WHAT DOES THE FEATURE ENABLE]. [CUSTOMER NAME] saw [QUANTIFIABLE RESULT]. CUSTOMER NAME. Who is one of your most successful customer examples? This can be a beta user if you don’t have customers. Example: XYZ Scalability Corporation. QUALIFICATION CRITERIA. What are unique traits that would help you identify other customers who are similar to this customer? Be descriptive so it’s easy to identify pairings. Cut by industry, employees, stage, tech stack, department, company size, milestone or team size. Example: SaaS, 50-200 employees, Series B, Vertical Response, SFDC, ten sales people, CMO in place, six-person marketing team. TITLE. Who in the organization did you sell to? Who had the biggest challenge? Each role within a company will have different obstacles. You’ll want to look at these as you put together your value proposition. Example: VP of Marketing concerned with branding and lead conversion rates. EXAMPLE OF CUSTOMER PAIN POINTS. What were the customer’s pain points before your solution? What did these pain points mean to their business? Example: Cancellation rates during onboarding had increased 12% over the last three months. Retention rates were dropping and the company’s reputation was suffering. ADDITIONAL DETAIL. Use rich descriptive language to describe the customer example. Highlight details that relate to your prospect’s pain points. Example: Onboarding emails weren’t targeted to where a user was in the onboarding process, resulting in low click-through rates, high unsubscribe rates and eventual cancellation. PRODUCT FEATURE. What product features were designed to address this challenge? Example: Automated behavioral email marketing. WHAT DOES THE FEATURE ENABLE (BENEFIT). How specifically does this feature solve the customer’s challenge? Example: Email customers based on behavior in product. Send personalized emails to customers based on their specific onboarding path. QUANTIFIABLE RESULT. What statistical validation do you have to confirm that the pain point described by your customer was addressed by your solution? Example: Two months after we implemented automated behavioral email marketing, we’d reduced the time to convert by 30% and increased overall conversions by 63%, which translated to 4.2M in revenue for XYZ. Early startup stories — those belonging to the founder and first customers — are just a piece of the greater machinery that make up an introductory sales conversation. Most sales processes stress asking the right questions, which is key to getting the information you need to convert a prospect. Goal: To relate — or even better — laugh. How: Try citing something that you found out about the company, market or industry. Talk about a mutual connection. Share something that recently happened or how you’re feeling, such as being wired on too much coffee. Self-deprecation or a positive experience are reliable choices. Make yourself human. Tip: “I like to start with laugher, if possible. Laughter establishes—or restores—a positive emotional climate and a sense of connection between two people. It literally forces two people to take pleasure in the company of one another,” says Sales. Goal: To give context and assume control of the conversation. How: Mention how you were connected. Give your name, title and a little something about yourself. Ask for names, titles and responsibilities. Introduce members of the team, if your colleagues are participating. Confirm how much time can be allotted for the conversation and thank them for taking the time. Goal: To get an understanding of _____ about them and discuss how you help them with ______. To outline next steps if there’s a fit. How: Set a structure for when questions should be asked. Should they be ad hoc during the conversation or are you leaving time for questions at the end? Is it a discussion or a pitch? Always pause for questions as relevant to the structure of the call. Ask them their goals for the call and what they’d like to make sure is covered. Goal: To determine if a prospect is a good customer for you. How: Ask value-based questions (VBQ) and give value-based responses (VBR). Your VBQs should collect what you need to know about the customer to know if they are a good customer for you. Taken another way, what do you need to know to identify a customer case study to share that will resonate with your prospect? You want to keep it at around two to three questions here, so make them count. Design your VBRs to share knowledge of your industry, educate the prospect and establish credibility. Tip: “Casually mentioning a competitor in your VBR is a great way to pique curiosity and engage your customer. Statistics are also an effective way to guide a prospect’s thinking and anchor the problem that you’re solving for them,” says Sales. Goal: To establish credibility through the experience of others. How: Cite a relatable customer story (outlined above) that establishes ROI for the prospect. If you have more than one, draw from your categorized story bank that’s segmented by industry, customer title, problem, tech stack and so on in order to be maximally relatable. Tie the story back to the pain points you uncovered in your qualifying VBQs. If you don’t have paying or beta customers yet, use your founding story or customer discovery conversations. Goal: To dive deep into the customer’s pain points. How: Ask up to three VBQs to answer the following questions: What do you need to know about the customer to know the ROI you offer the customer? What do you need to know to put together a clear use case for the customer? In your VBR, empathize with the customer’s pain. Place those issues alongside relevant customer examples and statistics. Tip: “VBRs are not a pitch. They should be focused on relating to the customer’s pain points, educating the customer on trends in the market and empathizing with the problem your product solves for the customer,” says Sales. Goal: To validate that you can help them and express how. How: Take the key benefits of your product that apply to your potential customer that you’ve learned from your VBQs and back into a ROI calculation, if you can. Use the customer’s description of her problem, pulling out keywords she uses to describe her pain points. Articulate what your product will mean for their business. Pause for questions. Goal: To assess if they can act. Flush out objections and concerns. Understand their decision making process. How: Remember this acronym “BANT,” which stands for Budget, Authority, Needs and Timeline. It’s outlasted all the sales acronyms because it works. For budget, ask: “How do you typically evaluate tools like this as a team? Is this something your prospect has resources and budget allocated for?” For authority, you know who’s on the call and their role, but still ask: “Is there anyone else who would need to see the product or needs to be involved in the decision making process?” Get an understanding of their role and why they care. For needs, you should have already established this at this point in the meeting. For timeline, ask: “Have you ever purchased a tool like this before? What was the process like?” Remember to ask about any legal or procurement processes that might extend or impact the sales process. Tip: “After you feel that you fully understand what happens on their end after the call — if they did not buy on the call — repeat back what you learned and get confirmation that it’s correct,” says Sales. Goal: To clarify the next steps for them and for you, if you didn’t close the deal in the conversation. How: Clearly state your to-dos and confirm their homework. You should know what will happen when you conclude the conversation. Tip: “If possible, schedule the next meeting and preview its agenda before you wrap-up your conversation. This establishes an implicit deadline before the next meeting,” says Sales. If asked the right questions, your customers will tell you everything you need to know in order to sell to them. Founders who are just starting to sell should look at their own story as the first customer story. They’re the ones who not only identified a meaningful problem, but have personally acted to solve it. Having this problem in common forms a bridge to a prospect, across which a founder can cross to offer a solution. Early stage founders and salespeople must unabashedly reach for the founder’s story until they collect use cases from early customers. Startups with green sales functions should run through Sales’ exercises to create versions for both stories. 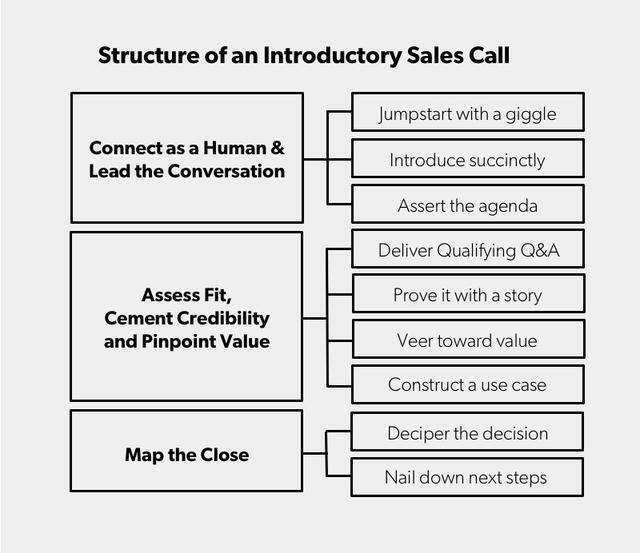 Once created, teams can integrate these narratives into the structured sales calls she outlines.